I absolutely adore roast pumpkin. 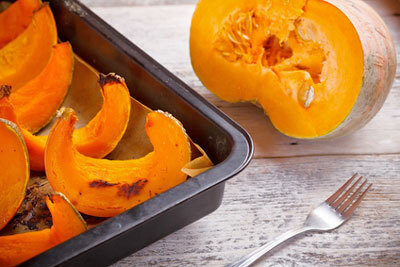 Roasting pumpkin is not only easy but seems to enhance the flavor and bring out the sweetness. Pumpkin is not just a winter comfort food. It can be served as a side to roasts or added to almost any dish. It’s fabulous tossed through salads or added to pasta for a splash of color and a kick of flavor. But rather than sticking to just plain old pumpkin I prefer to add other flavors. Pumpkin has a mild taste so you can use strong flavors like cumin. It also has a slightly sweet flavor, so things like brown sugar, honey, cinnamon and maple syrup complement it nicely. If using a whole pumpkin, cut in half using a large knife. Scoop out the seeds and the fiber. You can set the seeds aside to be toasted later. Cut the pumpkin into 1 inch thick wedges. Using a large knife, set the knife into one of the grooves, and slowly push the knife down until you have made a cut. You may need to rock the knife back and forth. Pumpkin can be roasted with or without the skin. Place slices onto a baking tray lined with baking paper. This will prevent the pieces sticking to the bottom. Arrange the slices in a single layer. Piling up the pieces means they won’t cook evenly. Rub both sides with olive oil and sprinkle with salt and pepper. Pumpkin cooks quickly, and shouldn’t take longer than 45 minutes to cook. Baked until soft enough to be tested with a fork. Use this basic recipe as a starting point. Then start adding other flavors and ingredients for added spice and zestiness. Preheat oven to 200°C / 400°F. Line a shallow roasting pan with baking paper. 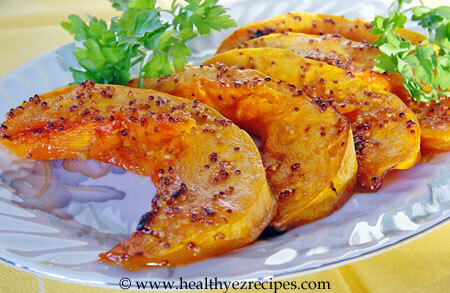 Peel and cut pumpkin into 3 cm / 1 – 1 ½ inch thick wedges. Place the wedges in a large bowl. Combine oil, honey, mustard and garlic in a jug. Pour or spoon the mixture over the pumpkin, turning the pieces to coat all sides. Arrange in a single layer in the roasting pan. Roast in the oven for 40 – 45 minutes or until golden and tender. Turn halfway during cooking so that each piece is evenly cooked. Remove from the oven and leave to stand for 3 minutes. Place the pumpkin on a large baking tray. Whisk the olive oil, maple syrup and orange juice in a small bowl. Season well. Pour the oil mixture evenly over the pumpkin. Roast in the oven for 40 – 45 minutes or until golden and tender, remembering to turn halfway through cooking. Arrange the pumpkin on a platter and garnish with chopped fresh parsley. Roast Pumpkin is excellent served with roast lamb or roast pork.